Learn about your baby's emotional and physical needs, while developing a parenting style that works in your family. - Publisher "What Does My Baby Need?" It's the question parents ask most often through the first two years. What does my baby need physically? Emotionally? Spiritually? What does she need to be prepared for her next stage of development? Now That Baby's Home addresses the major concerns parents have about infant care. Included are sections on; evaluating baby-care advice, discovering the parenting style that works for you and your baby, learning your baby's intricate language, medical concerns, what it means to spoil a baby, and more. 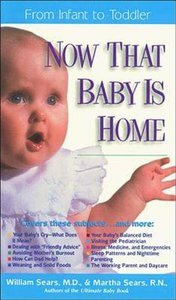 About "Now That Baby is Home"
"What Does My Baby Need?" It's the question parents ask most often through the first two years. What does my baby need physically? Emotionally? Spiritually? What does she need to be prepared for her next stage of development? Now That Baby's Home addresses the major concerns parents have about infant care. Included are sections on; evaluating baby-care advice, discovering the parenting style that works for you and your baby, learning your baby's intricate language, medical concerns, what it means to spoil a baby, and more.